I lied. okay I half lied. Fact one is I cannot cook . Fact two is only think I can make is a crepe cake. Anyway making a crepe cake for an enjoyable thing ! It is less mainstream and it is hassle free. Not to mention lesser things to prepare as well. My kitchen is quite pathetic. I do not have a non sticky pan at home. My oven can't even on. MEANING I COULD HARDLY MAKE ANYTHING . Butttttttt, my love for supermarkets saved me, months ago I found this ready made crepes ! I bought and left it in my fridge for a dam long time before I could eat it. So I used the ready made crepes to start making my crepe cake. At first I used nutella, turned out to be a disaster. I couldn't find a easy to make cream recipe , I decided to use custard cream instead. & Actually... I'm been hiding this recipe for a super long time. There's my cheat one crepe recipe in 3 steps. Why bother to torture yourself making crepes when you can buy ready made ones. Save so much time and effort ! I've gotten master chef crepe, from FairPrice. I follow the instructions in the video except that I cook it over small fire ( is that what you call it ?) and keep stirring it. Works well. You can go try both and you will understand. I guess this is the most boring part but I like it the most. Ya la I'm boring la. 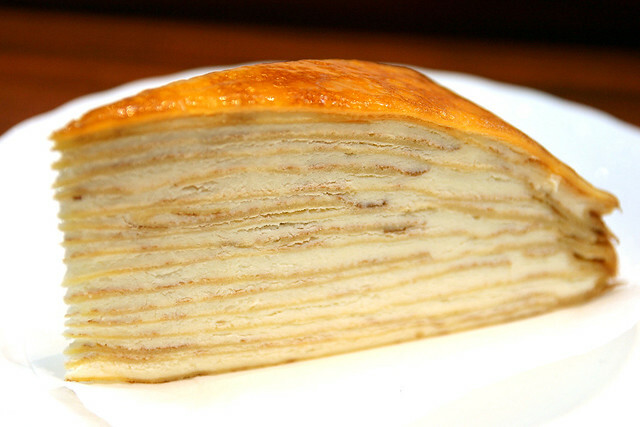 What you do is put a piece of crepe and layer it with custard cream then put another piece of crepe on top. Repeat step. What I do is I watch tv and sit down while piling them up ! Okay , it didn't look very pleasant looking but I brought it to the #cnos2 picnic and received compliments ! Noelle even ask me if I'm willing to take in orders. If she really does, or anyone else wants to order, I might kick start this as a career. I'm kidding. yupyup, go buy and try ! – your version look amazing! You are welcome, glad that you enjoyed it!